Audi has revealed its new A1 Sportback, the more practical five-door version of the A1 - a car that has proved very popular since it was launched in 2010. The new model will be available to order later this month with the first cars arriving in the UK in Spring 2012. It carries a £560 premium over the equivalent three-door A1 with on the road prices starting at £13,980. That gets you the entry-level 1.2 TFSI SE model. The top version is the 1.4 TFSI 185PS in S line trim which costs £21,270. The A1 Sportback is marginally bigger than the standard A1 three-door and has more head room and shoulder room inside. But the key difference is that it has three seats in the back - each with a headrest and a full three-point seatbelt. Boot space is on a par with the three-door A1 with 270 litres of carrying capacity, while folding down the rear seats boost this to 920 litres. Usefully, the L-shaped, retractable head restraints don't have to be removed to do this. There is an optional luggage package available which includes usefully divided storage compartments under the boot floor. On the outside, the A1 Sportback stands out from the A1 thanks to the option of contrasting roof colours rather than just the roof bars. The Sportback will also expand on the eleven paint colours available for the three door with a new colour – Samoa Orange – that will be exclusive to the new five-door. Standard equipment will include alloy wheels, remote central locking, air conditioning, electric front and rear windows and mirrors, split folding rear seat and a six-speaker single CD Concert audio system linked to a 6.5-inch retractable display. Sport models get larger 16-inch wheels, sports suspension, sports seats, Bluetooth mobile phone preparation and a Driver’s Information System, while S line versions have extras such as an S line bodykit including larger 17-inch alloy wheels, S line sports suspension and leather and cloth upholstery. 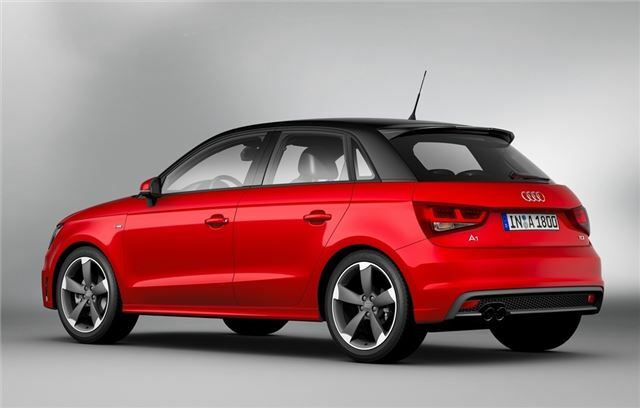 The A1 Sportback range will initially feature a choice of three TFSI petrol engines and one TDI diesel. The 1.2-litre TFSI (86PS), 1.4-litre TFSI (122PS), 1.4-litre twin-charged TFSI (185PS) and 1.6-litre TDI (105PS) line-up will be joined in the summer of 2012 by a new the 2.0-litre TDI with 143PS. Just introduced into the three-door A1 line-up, it will power the A1 Sportback 2.0 TDI to 62mph in 8.5 seconds, and has the potential for 68.9mpg.